In a few short weeks, our little baby will be turning 3 years old. Up until this point, Ryan and I have held off on the potty training process because 1) we weren’t in our own place, 2) Jordan wasn’t showing any indication that she was ready or interested, and 3) we were terrified of the endeavor. Now that we’re in our own house and plan to be here all weekend, we decided that now was the time to kick off the training. Jordan still has shown us no interest at all, but we figured since she’s almost three (and resistant to any new thing as a general rule), ready or not, it is potty time. All week long we have been coaching Jordan about her big weekend, so today when she woke up I nodded smugly when she said, “Today potty day, Mommy?” In my head I was feeling comfortable thinking that maybe this wouldn’t be so hard after all. Maybe there is some merit in waiting until now to start this less-than-fun process. Then we walked down the stairs. After wailing all the way to our bathroom (the Training Room), I convinced Jordan to sit on the potty for a few minutes. She pouted for a full five minutes before we agreed that she didn’t have to pee just yet. Her overnight diaper was a bit wet, and after the gnashing of teeth that had preceded our first potty sit-down, I figured that her morning pit stop had already occurred in her Pampers. Pulled up the big girl underpants, washed hands, marched to breakfast. I decided to heed my pediatrician’s advice and set a timer so we could head back to the potty every thirty minutes to try our luck. Once the timer was set, I presented Jordan with her oatmeal and raspberries and proceeded to clean up in the kitchen. 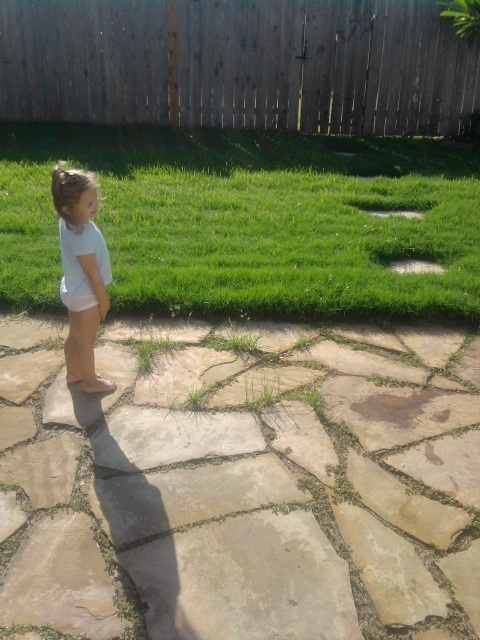 After a few minutes I asked Jordan if she needed to potty. That seemed pretty satisfactory to me, but just for curiosity’s sake, I decided to check her underwear. I peeked at the timer. 9 whole minutes had passed. I guess that morning pit stop was a bit later than I thought. Marched back to the Training Room, sat on the potty, changed in to dry underwear, washed hands. Jordan and I then had a conversation about her wet pants, and she seemed to get the whole concept as to why she felt damper than she had before. “If you feel like your pee pee is coming, tell Mommy, and we’ll sit on the potty,” I advised, and she seemed pretty comfortable with that. Back to breakfast and reset the timer. After a few minutes, Jordan announced she was done and wanted to go outside. Great, I thought, go enjoy the sunshine while I clean up the dishes. Perfect. We’re all set up in the Training Room, so I should be able to document this fairly well. She’s being a good sport! Just remember: potty training (almost) always works.